President Trump’s executive order blocking permanent legal residents and visa holders from seven majority Muslim nations from entry into the US resounded across the world on Saturday, sparking chaos at airports, media reports said. Trump’s directive issued on Friday suspended entry of all refugees to the US for 120 days, barred Syrian refugees indefinitely, and blocked entry into the country for 90 days for citizens of seven predominantly Muslim countries: Iran, Iraq, Libya, Somalia, Sudan, Syria and Yemen, reported News York Times. The Department of Homeland Security said that the order also barred green card holders from those countries from re-entering the US. In a briefing for reporters, White House officials said that green card holders from the seven affected countries who are outside the US would need a case-by-case waiver to return, the report said. Some legal residents were in mid-flight when Trump signed his executive order Friday — and were detained at airports upon arrival back in the States. One Google employee of Iranian descent barely made it back to the US before the ban went into effect, and the company said more than 100 of its workers were affected. A senior Trump administration official said green card holders from the nations of Iraq, Iran, Libya, Somalia, Sudan, Syria and Yemen would need a waiver to return to the US. Green card holders in the US would need to meet with a consular official before leaving the country, according to the official. Refugees already on flights when the order was signed on Friday found themselves detained upon arrival. 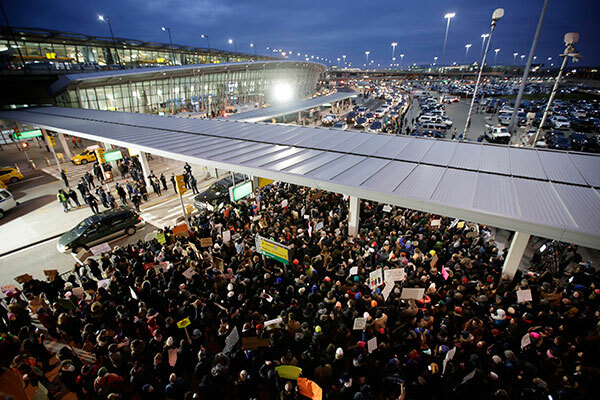 Peaceful protests began forming Saturday afternoon at Kennedy Airport, where nine travellers had been detained upon arrival at Terminal 7 and two others at Terminal 4, an airport official said. Similar scenes were playing out at other airports across the nation. An official message to all American diplomatic posts around the world provided instructions about how to treat people from the countries affected: “Effective immediately, halt interviewing and cease issuance and printing” of visas to the US. Internationally, confusion turned to panic as travellers found themselves unable to board flights bound for the US. In Dubai and Istanbul, airport and immigration officials turned passengers away at boarding gates and, in at least one case, ejected a family from a flight it had boarded, the report said. Meanwhile, a federal judge blocked part of Trump’s order on Saturday evening, ordering that refugees and others trapped at airports across the US should not be sent back to their home countries. But the judge stopped short of letting them into the country, the NY Times reported.